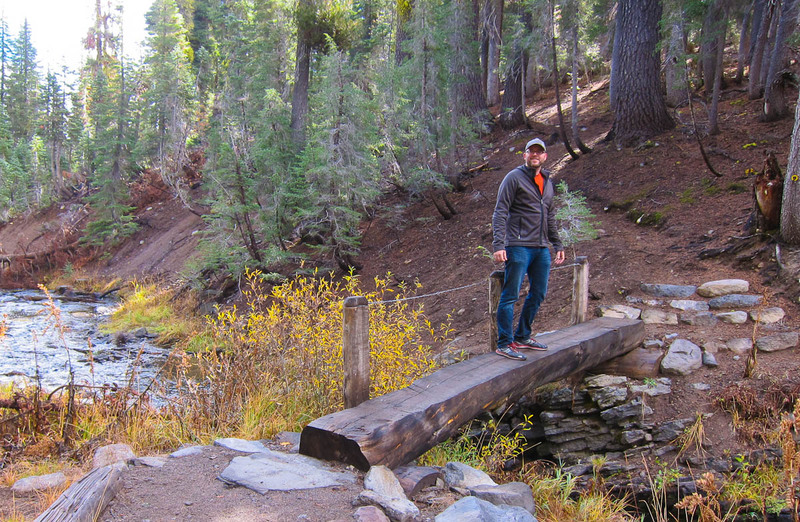 This past October right before the park shut down for the season we took our RV and visited Lassen Volcanic National Park. 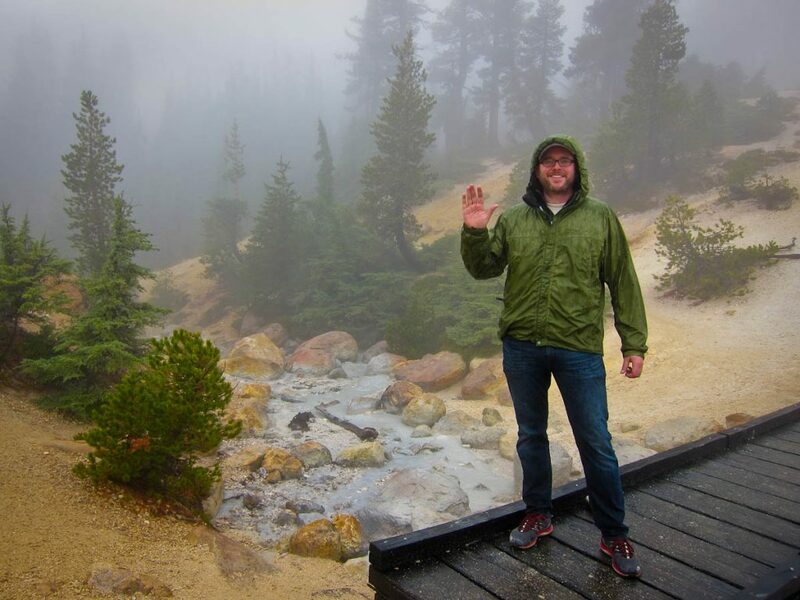 We’ve had Lassen on our bucket list for years, but it’s always been just a little bit out of the way or too far away to visit. Last fall we finally made the detour from I-5 to explore it for a few days. That Friday morning we began our trip from Bend, where we’d been camping for a few weeks. The 300-mile drive rambles through the rugged terrain of Route 97. 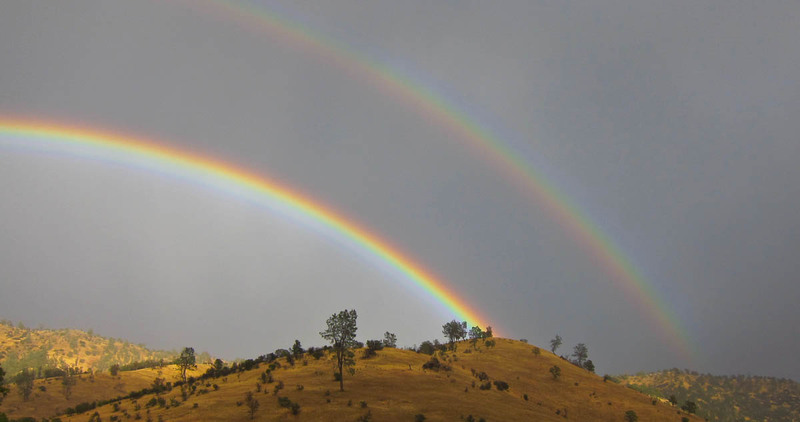 We were surprised by the wide variety of landscapes we encountered in such a short distance – from high desert to alpine forest, then to flower-filled meadows, and finally back to high desert! Sunset Magazine calls Lassen “The West’s most beautiful, least visited wonderland.” It’s the southernmost active volcano in the Cascade Range, and often described as “other worldly” because of its rock-strewn fields, steaming vents, boiling mud pots (fumaroles), craggy volcanic mountains, and other cool geological features. Come check it out with me! Just before dusk we made it to the park’s Northwest entrance and into Manzanita Lake Campground. 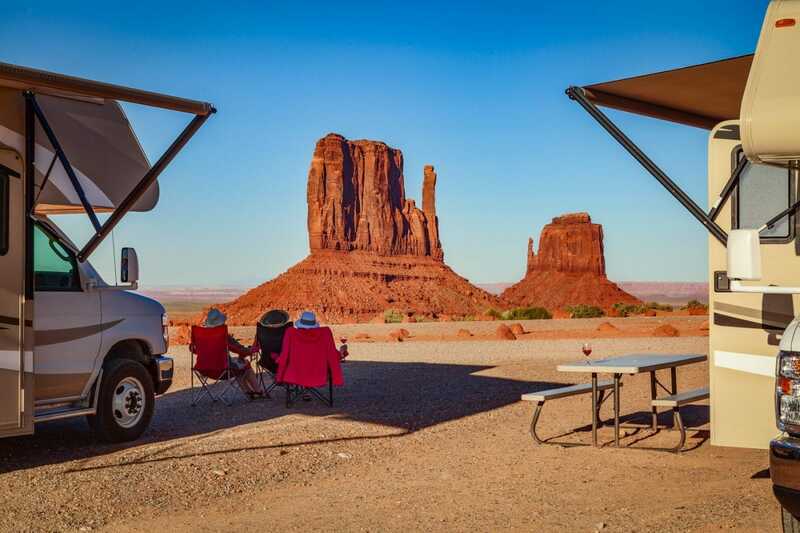 Out of the eight campgrounds in the park, it’s the largest, most accessible – and can handle RVs up to 40-foot long. 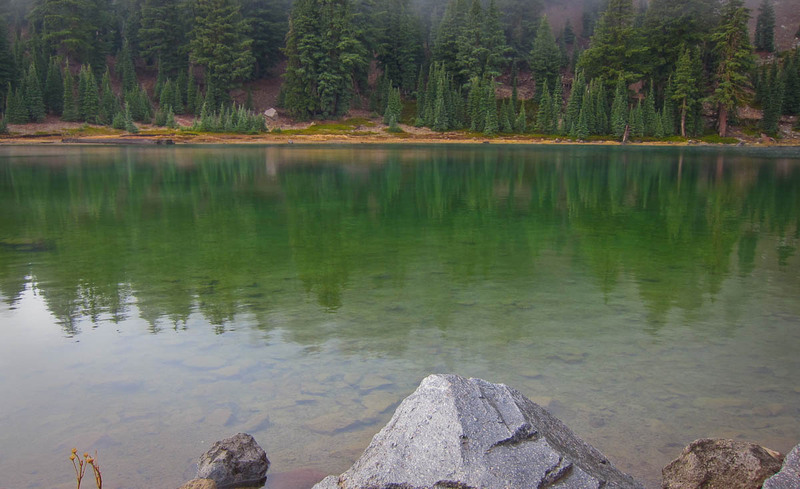 Manzanita Lake is located next to the campground, offering boating and other family fun. 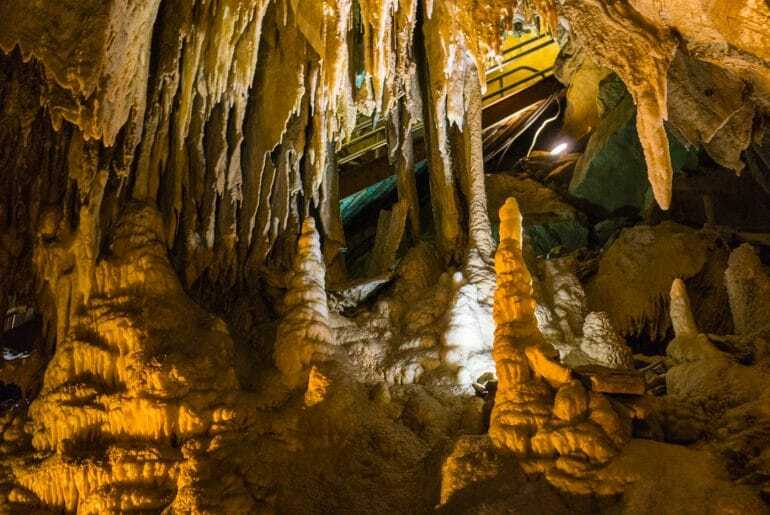 It’s tucked into a beautiful alpine setting, and has postcard-worthy views of the mountains, too! 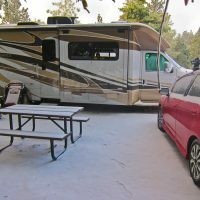 We definitely recommend this campground as a great place from which to explore the park – preferably in your tow vehicle – due to altitude and steep mountain roads. 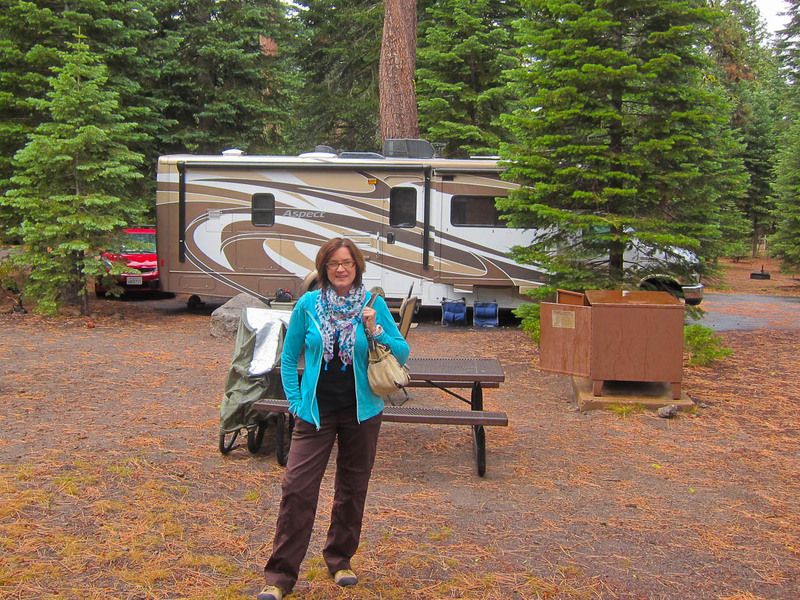 Our campsite was private and roomy and came with a fire ring and a metal food locker – reminding us that Lassen is in bear country. As we settled in for the night, we used candlelight rather than the usual RV lighting. We had no cell service either – so no checking email, messages, Facebook, or anything online. Great fun! 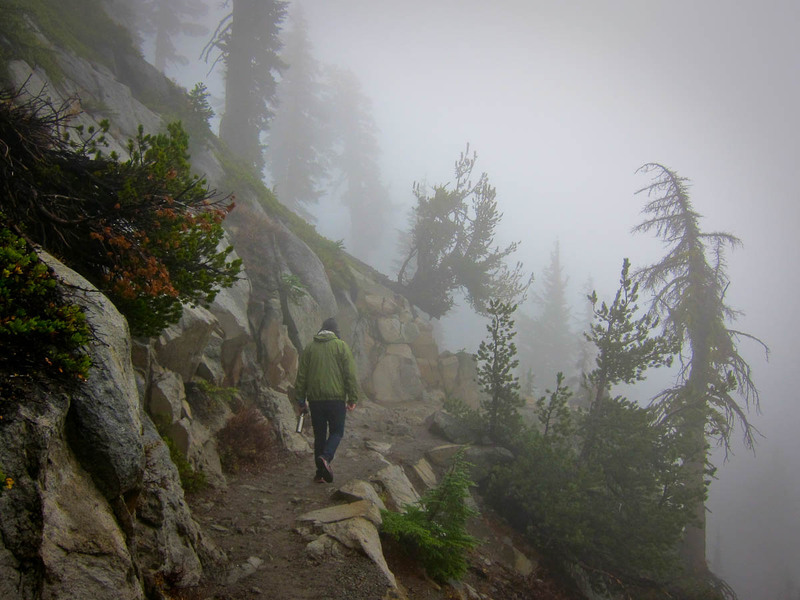 The next morning we woke to a chilling rain, along with a wet layer of dense fog. As we ate our breakfast we hoped for the rain to stop, while looking at maps and planning our day. 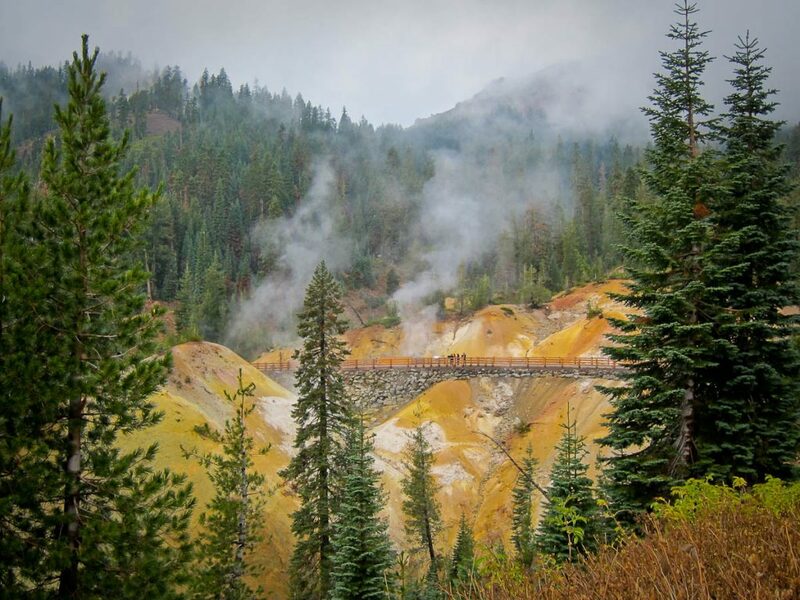 We were excited by one hike in particular, which focused on a curious-sounding destination called Bumpass Hell. 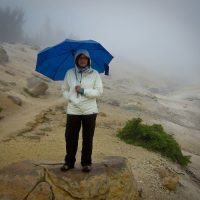 We put on our most rain-resistant clothes, and brought umbrellas, hats, and mittens for backup. 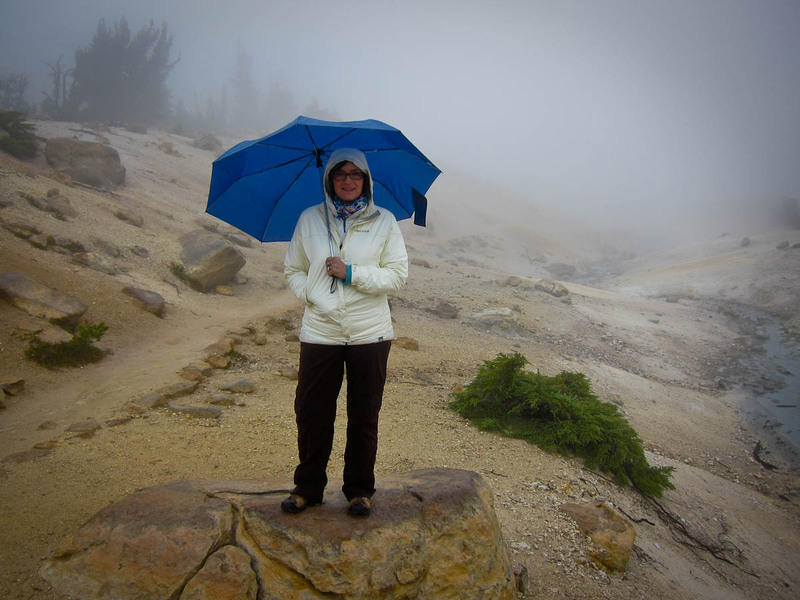 We like to camp in moderate climates most of the time but we come prepared for most any weather. Our first stop was the Loomis Museum, where we saw a film that described the park’s history and its famous geothermal features. It’s a newer building, full of educational displays on volcanoes, geology, and other interesting artifacts. 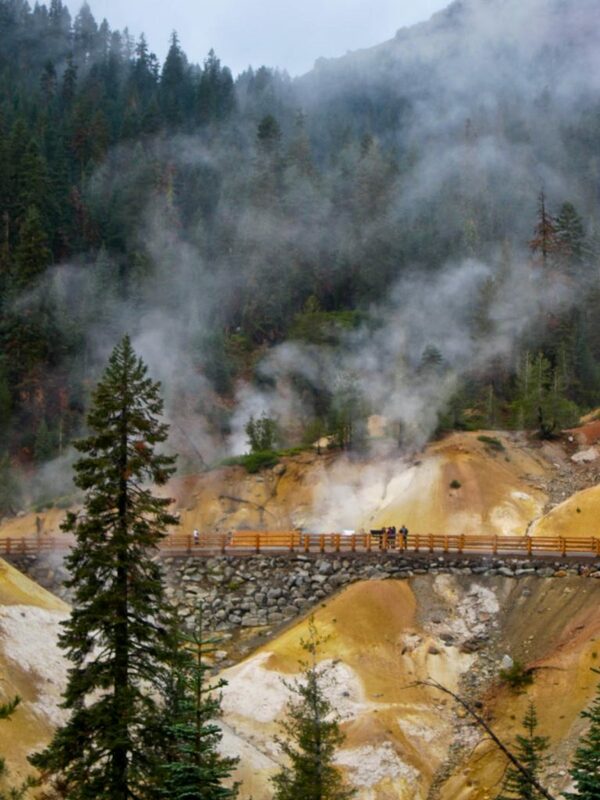 Loomis is only open in the summer and fall, but if you visit Lassen it’s definitely worth a stop. Next we got back onto the Main Park Road, which is a well-maintained, paved loop. It runs 29.7 steep and windy miles from the Southwest entrance, and connects to the Northwest entrance. This makes it easy to get a good visual overview of the park if you’re pressed for time and can’t do any hiking. The Weather Did Not Cooperate! 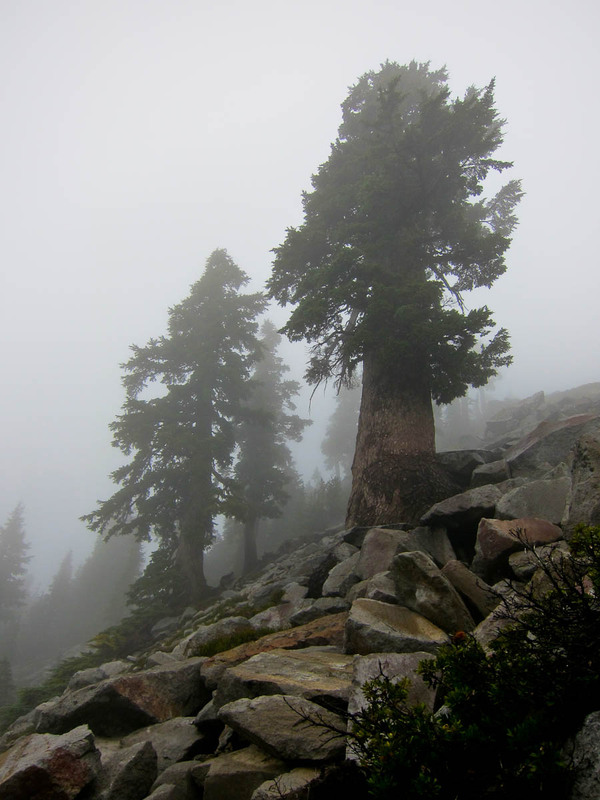 The drive was a bit uninspiring since most of the landscape remained shrouded in clouds and mist. We could only see glimpses of lava flows, scenic valley views, and swathes of burned forest. 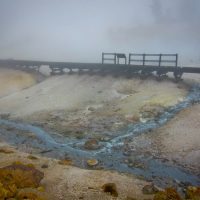 Still, we were intrigued by what we could see – and by the road signs that bore names like Chaos Jumbles, Devastation Area, and Loomis Hot Rock. 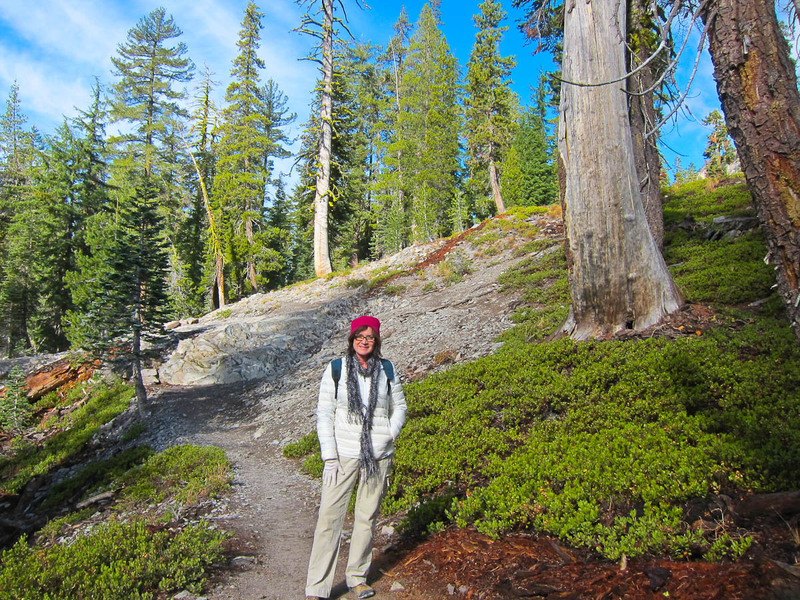 We eventually arrived at the parking lot and trailhead for our hike to Bumpass Hell. 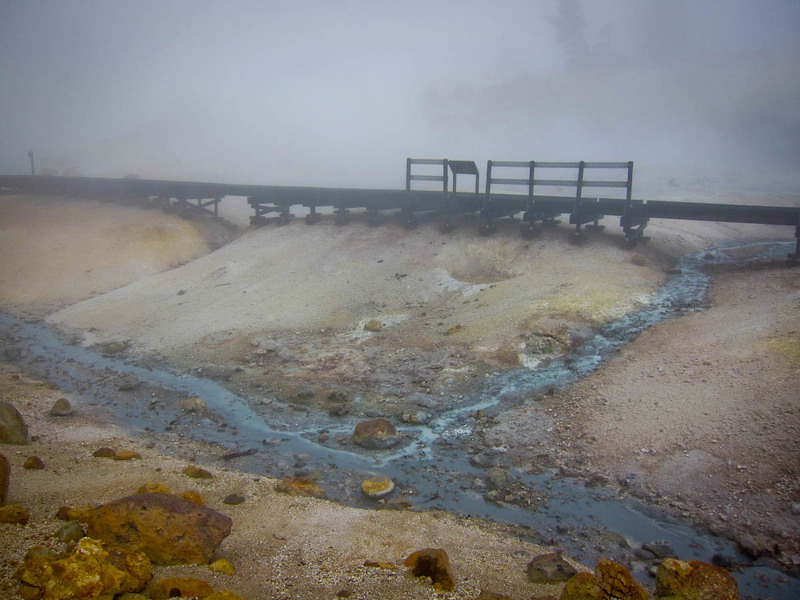 This 3 mile round-trip hike takes you to to one of the park’s famous, steamy hot spring landscapes and is one of Lassen’s most popular hikes. The hike starts at around 8,200 feet, so isn’t easy if you’re not used to high altitudes. Fortunately for us, we were coming from the high desert of Bend, so this gave us a little leg up. 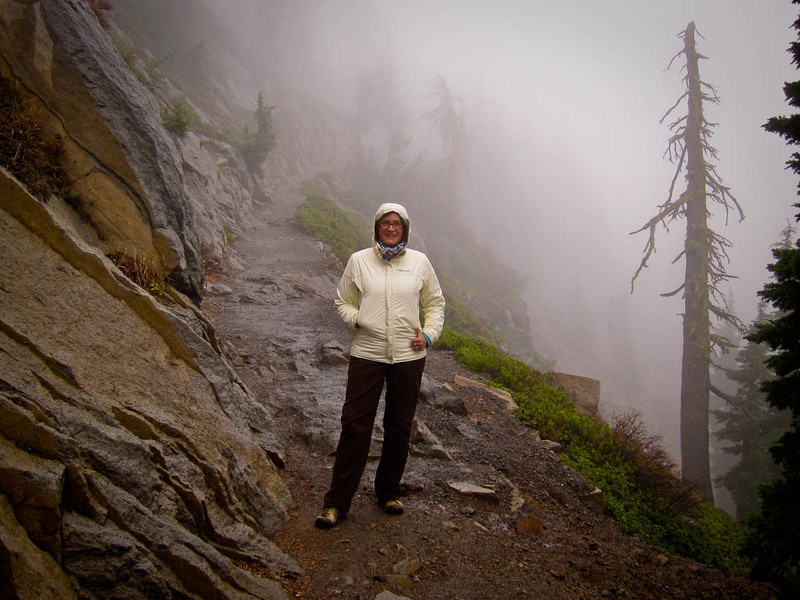 As we’d suspected, the climb was rainy and foggy. But we were prepared, and were also preoccupied by the scenery. The path took us along cliffs and scenic overlooks, and and the terrain we could see was beautiful. 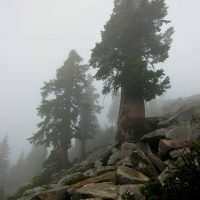 Large pine trees towered overhead, and old lava beds surrounded the path. 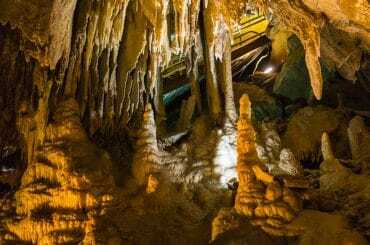 It felt like a foreign landscape, with us trekking through a Lord of the Rings movie! 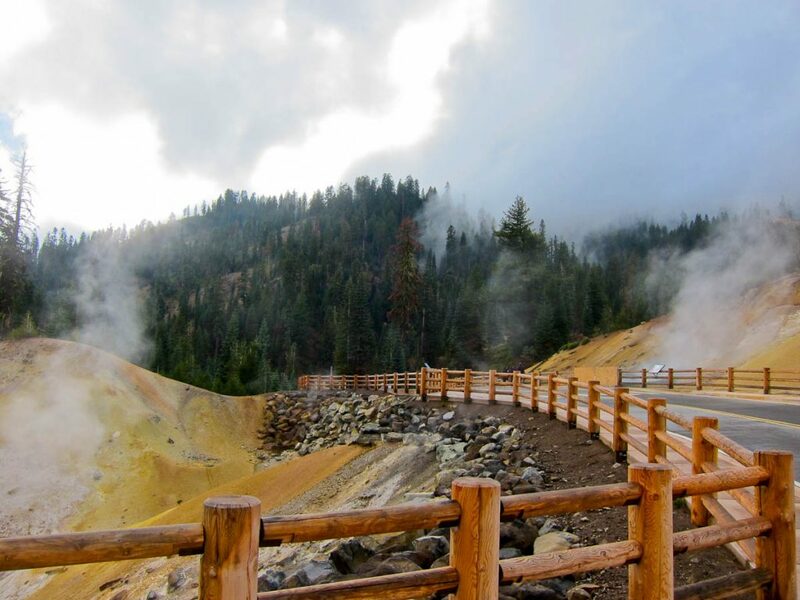 Bumpass Hell is a 16- acre area that contains steam vents, and boiling mud pots – as well as colorful rocks and lava flow formations. 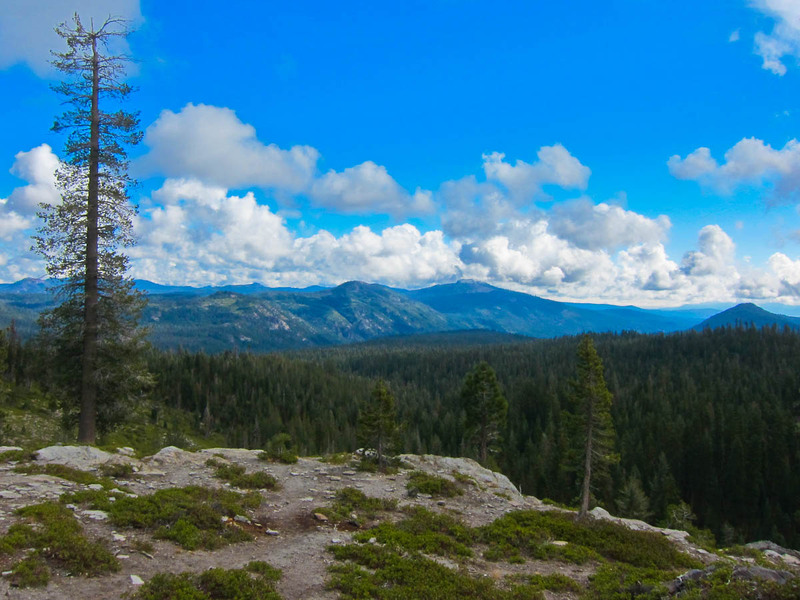 The main area sits in a bowl-shaped depression or small valley – and is surrounded by boulders. 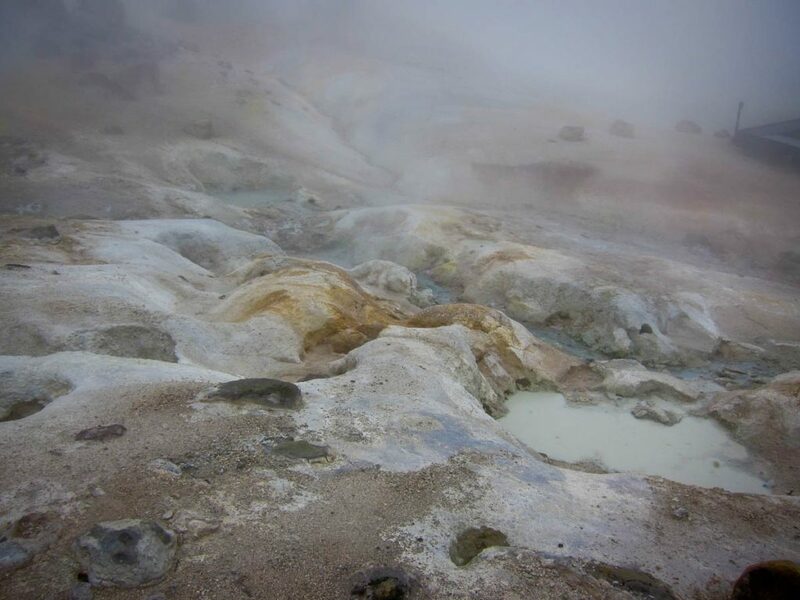 As we figured, many of the geothermal features we came to see were hidden by mist. It looked like we were walking into a steam room (minus the heat) as we descended from the path and stepped cautiously onto the boardwalk. 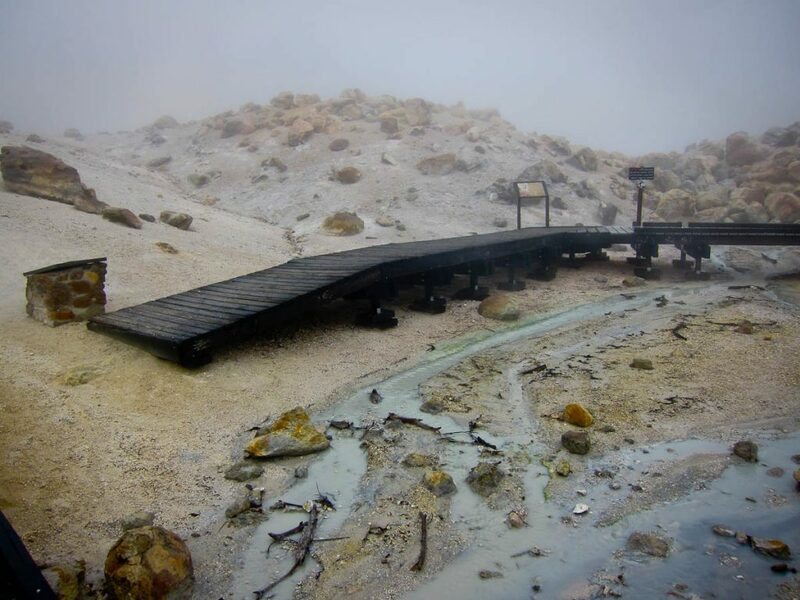 The boardwalk has a few sections, which takes visitors along the main areas of Bumpass Hell. We did manage to see patches of the landscape, and got some decent pics from under our umbrellas. But it was cold and wet so after a short time we were ready for our hike back to the car. 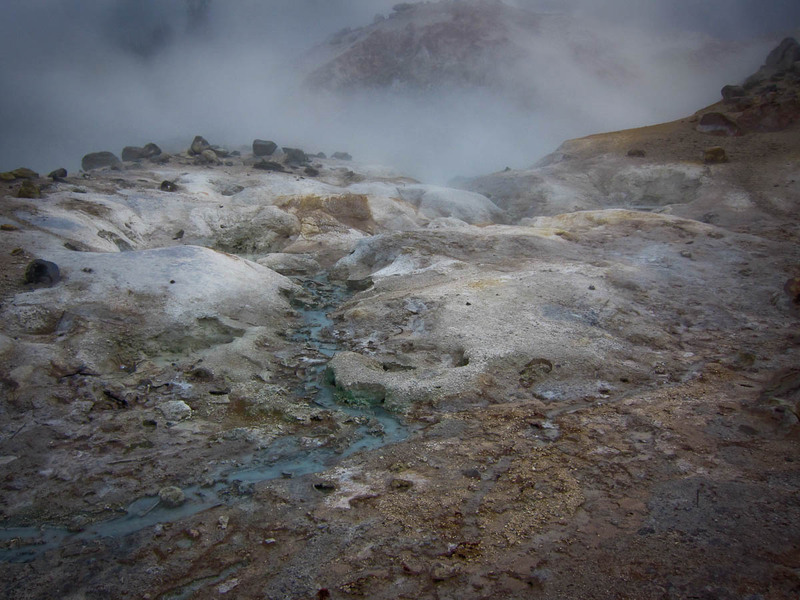 If you ever hike to Bumpass Hell, we recommend you wait for a clearer day than we did! Next we drove down the hill to Sulphur Works, which was supposed to be our final destination for the day. 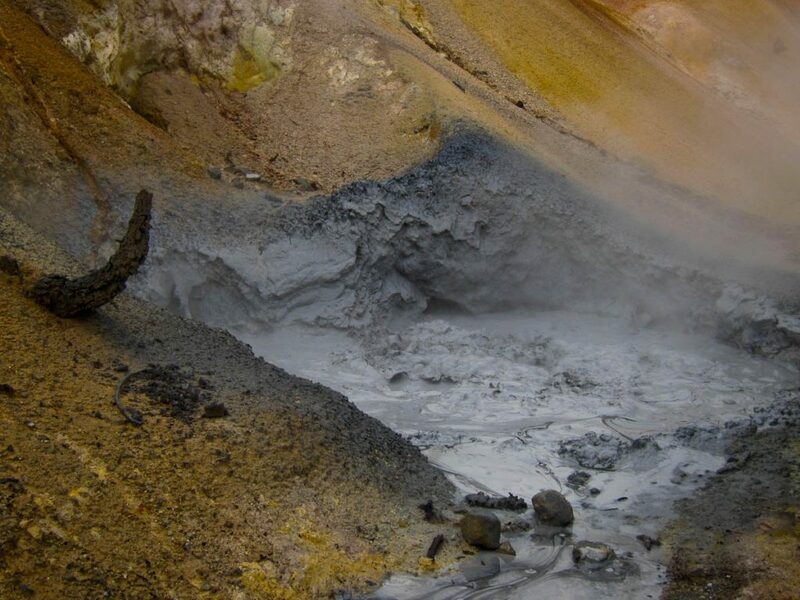 As we rounded the bend we were shocked by the vivid rainbow of yellow, lime, and rust colored earth embedded in the hillsides of Sulphur Works. In our photos it looks like we enhanced the colors, but we didn’t! As an artist I’m fascinated by the variety of colors in the earth, which come from minerals such as iron oxide, copper, and even gemstones. Every time I see these colors I feel inspired to paint them! 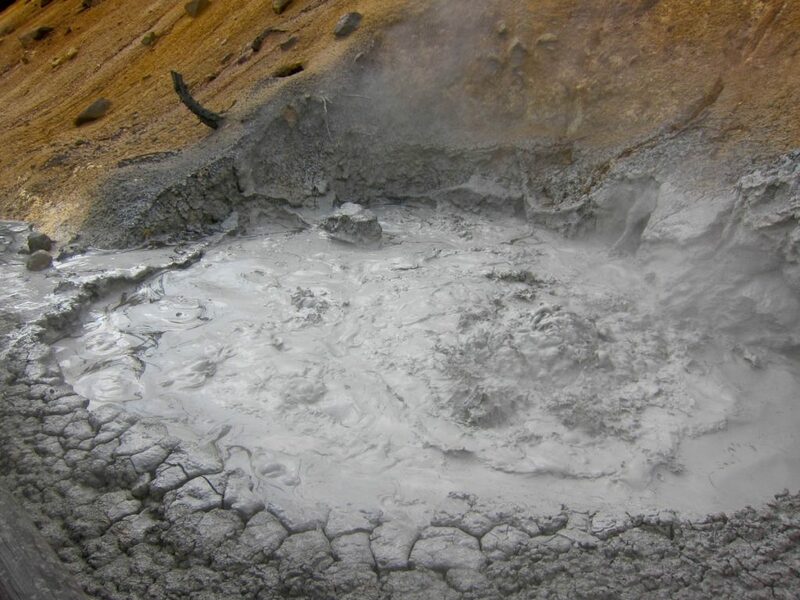 We parked and walked just a few hundred feet along the roadside to check out a boiling mud pot. It looked like a large hole filled with thick and bubbling cement. 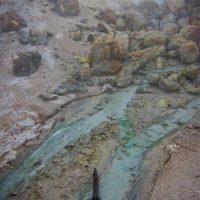 The sulfur became apparent as the air hung heavy with the smell of rotten eggs but we weren’t complaining. 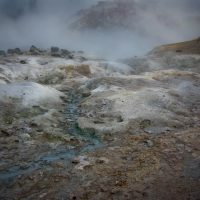 The hillsides surrounding the mud pots also contained a few steam vents, complemented by patches of cheerful wildflowers. 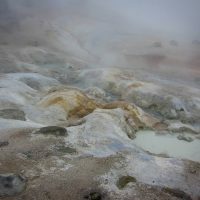 We were thrilled to finally see the geothermal landscape we’d been hoping to see earlier! Satisfied with our day, we headed back around the Main Park Road toward camp. We stopped along the way to see Emerald Lake, which lives up to its name with deep green water that beckons you to stop and take it in. Further along, we got waylaid by a few other hard-to-pass-up photo ops! 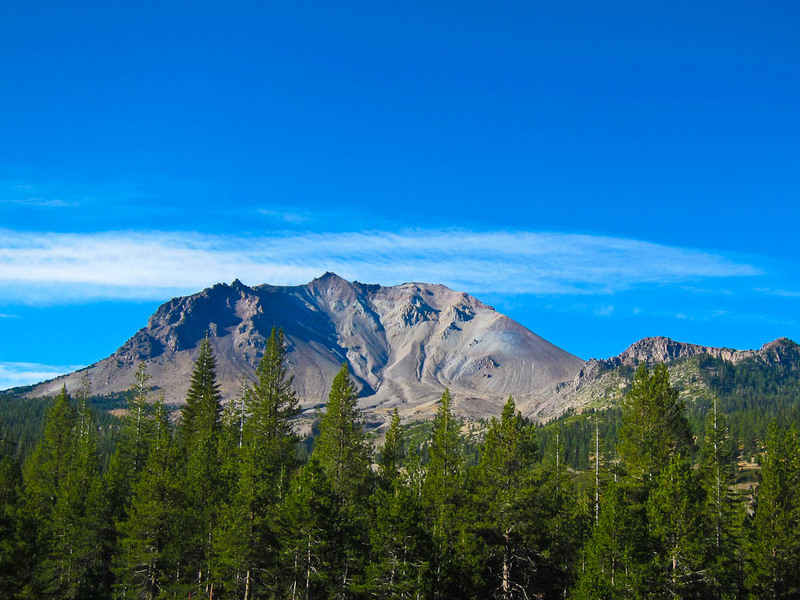 We finally get a peek of Mount Lassen, which tops off at 10,457 feet – and neighboring Crater Mountain, at 8,645 feet (pictures at the top of this post). Lassen is unique, in that it doesn’t look like a traditional volcanic mountain, but is more jagged and craggy. Our last stop was Loomis Hot Rock, which is part of the area called Chaos Jumbles. 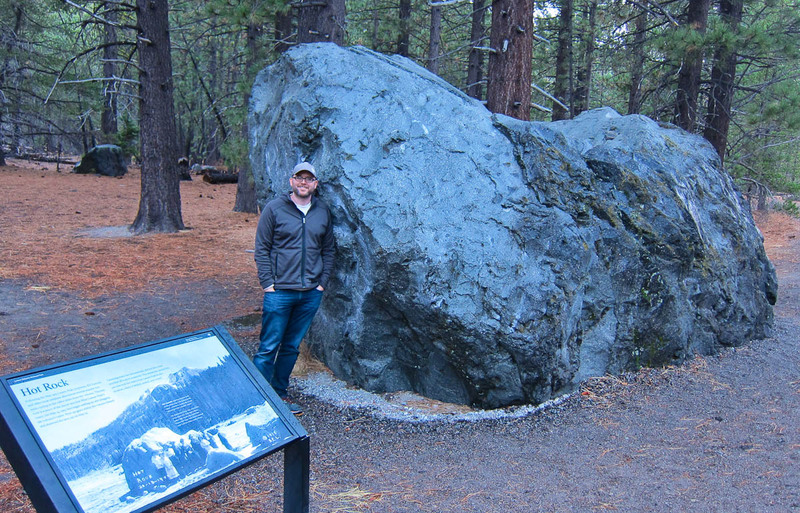 The story goes that Loomis Hot Rock is one of the larger volcanic boulders that was transported a particularly long distance by the mudflows during Mount Lassen’s Great Explosion in 1915. In fact the entire area is covered with large random boulders, so you can almost picture the explosion in action. Pulling into our campsite we were grateful to put on PJs and to get warmed up in our cozy RV for the night. 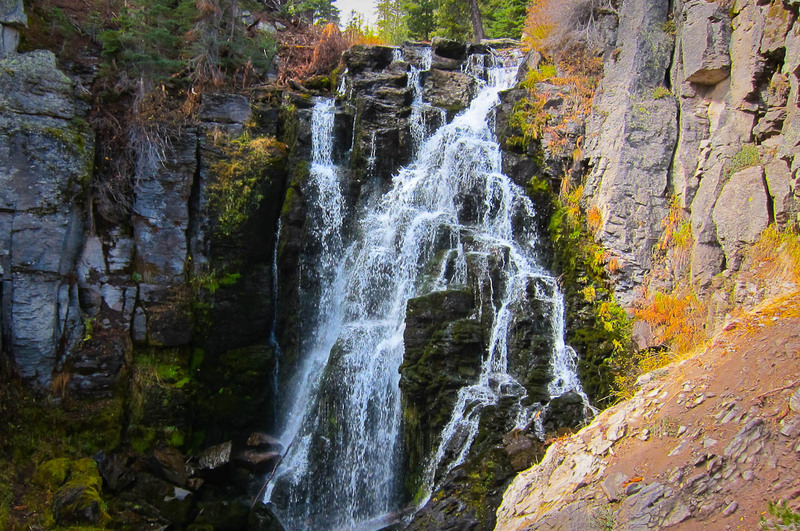 We’d decided to do the 2.2 mile round-trip hike to Kings Creek Falls since it is one of the most highly rated hikes. 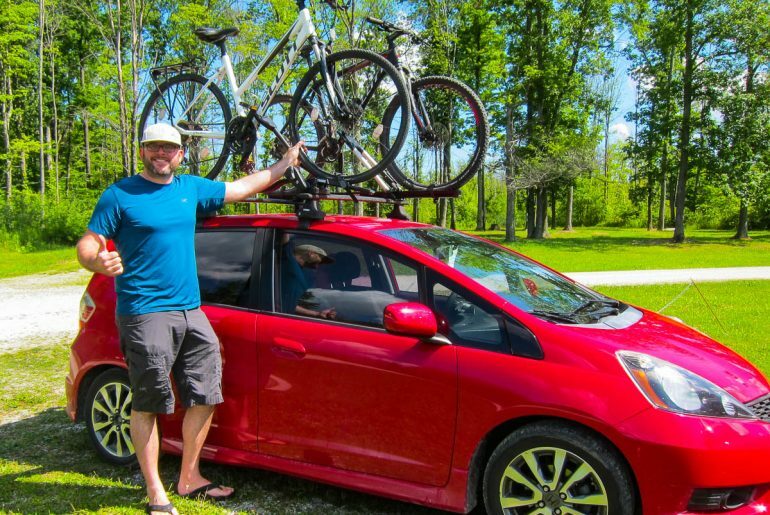 With a modest 300-foot elevation gain, so we figured it would be a pretty easy trip for us. We headed out with the usual clothing layers, in spite of the fact that the clouds had lifted to reveal patches of blue skies. We took a short drive on the Main Park Road, to the Kings Creek parking lot and there was plenty of parking. The dirt hiking path led us through marshy meadowlands before giving way to a cheerful forest. 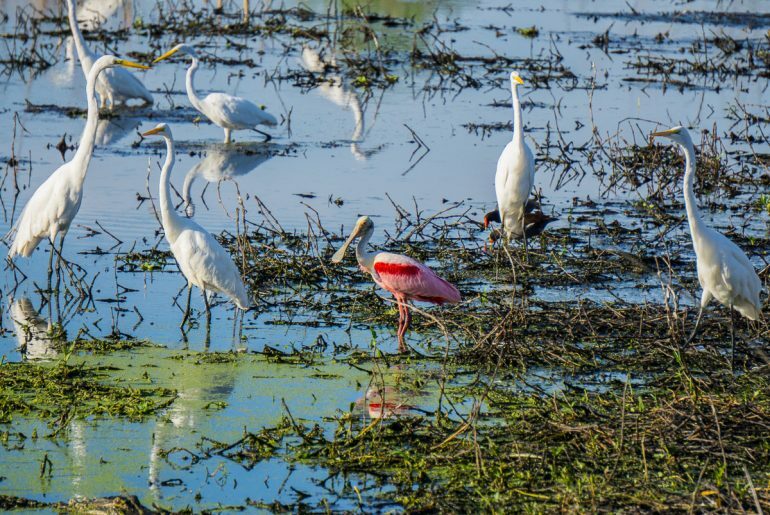 Rich enjoyed taking a group of colorful photos, which was a nice change from many of the white-and-gray photos he took on Saturday. Next we began the gentle climb toward the rocky slopes that lead to the waterfall. 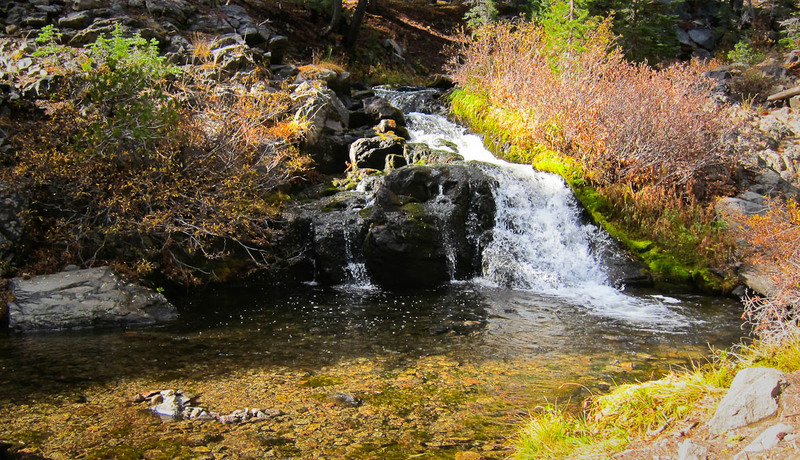 The air was fresh after the rains and we could hear the rushing water from the nearby Kings Creek Cascades. The cascades consist of a large stream with a series of short waterfalls, which eventually flow down to the main falls. As we trekked further uphill, we noticed part of the trail was closed off due to erosion. A sign guided to use an alternate horse trail, which added an extra mile to the hike – aha! 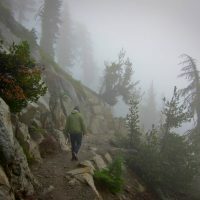 I found to be a bit on the steep side – especially when envisioning a horse trying to navigate it. Familiar boulders were scattered along the trail, making it feel like we were bouldering rather than hiking – as we neared the falls. I was glad when we finally saw Kings Creek Falls, and began the steep staircase-like descent to the overlook. The falls are about 45-feet high, and we were able to walk along the edge of the overlook, which was roped off for safety. Rich scrambled down closer to the bottom of the falls. I was pretty tired so I enjoyed sitting and enjoying the view from the top. The falls are striking, with rich, black volcanic basalt rock contrasted by the bubbling white water spilling over the top. Bright green moss covers the canyon-like walls of sheer rock creating a natural frame for the falls! Rich Found Another Path to Explore.. The weather remained nice as we packed up and stopped at the dump station before leaving the park. We looked forward to the 200-mile drive into warmer temps into the valley, as we headed toward our next campground in Russian River CA. 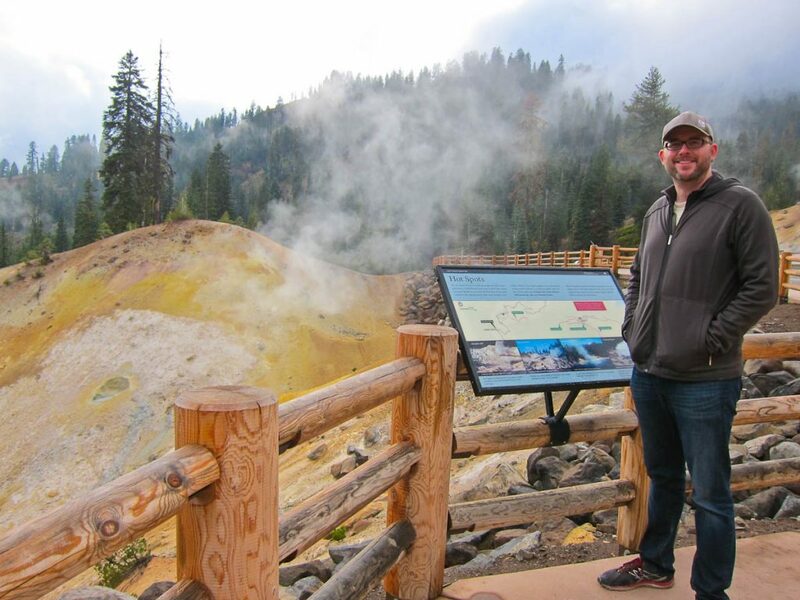 In spite of the weather, our two-day stay in Lassen Volcanic National Park was well worth the drive and we highly recommend it. 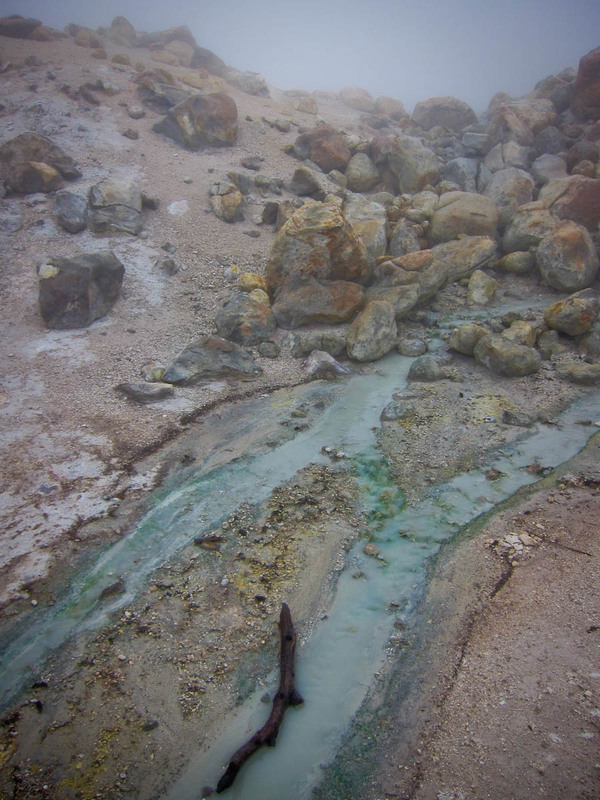 I’ve read that Lassen isn’t as impressive as Yellowstone when comparing their geothermal landscapes. 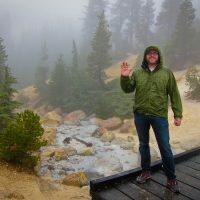 We haven’t been to Yellowstone, but Lassen is still unique and gorgeous, with many great hikes tucked into a fairly compact area. Plus it’s generally much less crowded, which we prefer. 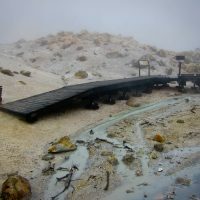 We only saw a portion of Lassen during this short trip, but hopefully this article gives you a good idea for some of the things you can expect to see and do if you decide to go there.